This is the first in a series of reports that NCAER has prepared on detailed tourism satellite accounts for the states and Union Territories of India. 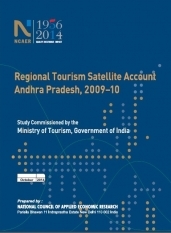 This study was commissioned by the Ministry of Tourism in the Government of India in 2013 to compile Regional Tourism Satellite Account for all states and UTs of India for the base year 2009-10 in order to facilitate a complete understanding of the tourism sector. The first report covers the states of Andhra Pradesh, Bihar, Gujarat, Jammu & Kashmir, Punjab, Rajasthan, Sikkim, Tripura, Tamil Nadu, and West Bengal.